Tag Archive | "Gymnocorymbus ternetzi"
The Black Tetra (Gymnocorymbus ternetzi) is also known by tropical fish keeping enthusiasts as the Black Skirt Tetra, Petticoat Tetra, High-fin Black Skirt Tetra, and Black Widow Tetra. The Black Tetra is a peaceful, shoaling tetra that is found in the Paraguay and Guaporé River basins of southern Brazil, Argentina, and Bolivia. It is sometimes confused with the Black Phantom Tetra (Hyphessobrycon megalopterus) which is an entirely different species. The Black Tetra gets its name from their translucent black coloring. It has a somewhat tetragonal body shape which is greyish to silver in color, and fades from almost black at the tail to a light silver at the nose. They have two prominent, black, vertical bars that appear just behind the gills. Adults develop long flowing black fins. 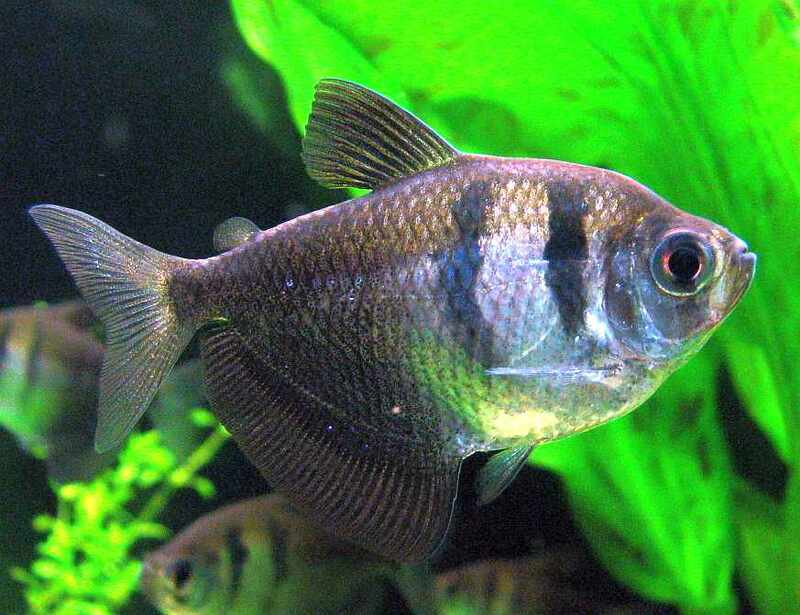 Recently, genetically modified Black Tetras under the generic name GloFish Black Tetras have become available in shades of bright green, orange, purple, and pink. Black Tetras are a hardy addition to any peaceful community aquarium. Being a shoaling species, it does best in groups of at least 6 or more fish and gets along well with other tetras, Danios, Corydoras, etc. In a community aquarium they need a densely planted tank with a sandy substrate, some rocks and driftwood to give them a sense of security. It is a mid level swimming fish that likes plenty of hiding places, so give them some rock caves and higher growing plants for them to hide among. The Black Tetra is one of the more common species that is widely available for purchase. They are egg scatterers that reach sexual maturity at two years of age and will lay their adhesive eggs among the plant leaves in the aquarium. Like most other species, they will eat their eggs if they are not removed from the tank. For optimal breeding, place them in a tank with slightly acidic water and some fine leaved plants like Cabomba, or a breeding mop, and minimal water movement. After the eggs are fertilized, remove the parents from the breeding tank. When the eggs have hatched and the fry are free swimming, feed them baby brine shrimp, daphnia, or finely crushed flake food. In their natural habitat Black Tetras feed on small insects, crustaceans, worms, and plant matter. In an aquarium environment they readily accept quality flake foods, micro pellets, live or frozen brine shrimp, mosquito larvae, daphnia , freeze dried bloodworms and tubifex . 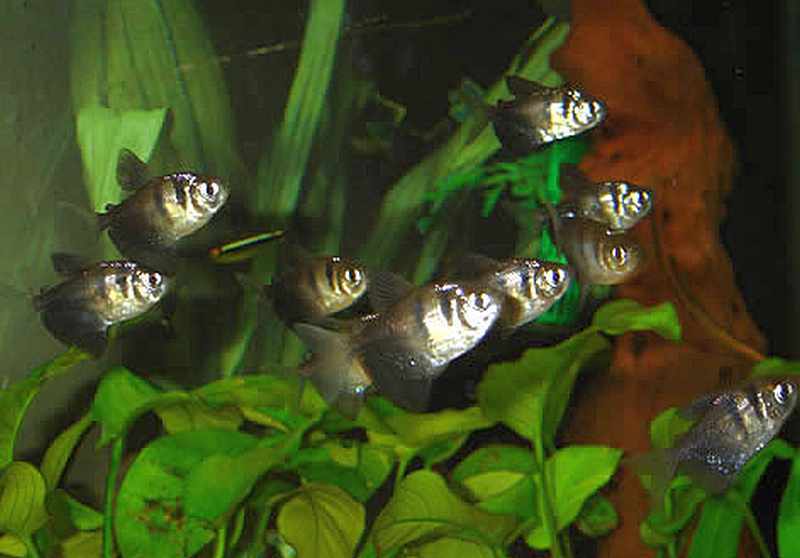 When available for purchase, Black Tetras are usually 1/2″ to 1″ in size.